"I think, therefore I exist, as a thing that thinks." "...In the statement 'I think, therefore I am' ... 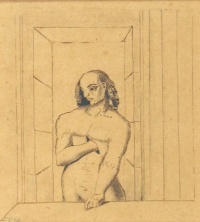 I see very clearly that to think it is necessary to be, I concluded that I might take, as a general rule, the principle, that all the things which we very clearly and distinctly conceive are true..."
John Locke's chapter XXVII "On Identity and Diversity" in An Essay Concerning Human Understanding (1689) has been said to be one of the first modern conceptualizations of consciousness as the repeated self-identification of oneself, through which moral responsibility could be attributed to the subject—and therefore punishment and guiltiness justified, as critics such as Nietzsche would point out, affirming "...the psychology of conscience is not 'the voice of God in man'; it is the instinct of cruelty ... expressed, for the first time, as one of the oldest and most indispensable elements in the foundation of culture." John Locke does not use the terms self-awareness or self-consciousness though. According to Locke, personal identity (the self) "depends on consciousness, not on substance" nor on the soul. We are the same person to the extent that we are conscious of our past and future thoughts and actions in the same way as we are conscious of our present thoughts and actions. If consciousness is this "thought" which doubles all thoughts, then personal identity is only founded on the repeated act of consciousness: "This may show us wherein personal identity consists: not in the identity of substance, but ... in the identity of consciousness". For example, one may claim to be a reincarnation of Plato, therefore having the same soul. However, one would be the same person as Plato only if one had the same consciousness of Plato's thoughts and actions that he himself did. Therefore, self-identity is not based on the soul. One soul may have various personalities. "personal identity consists [not in the identity of substance] but in the identity of consciousness, wherein if Socrates and the present mayor of Queenborough agree, they are the same person: if the same Socrates waking and sleeping do not partake of the same consciousness, Socrates waking and sleeping is not the same person. And to punish Socrates waking for what sleeping Socrates thought, and waking Socrates was never conscious of, would be no more right, than to punish one twin for what his brother-twin did, whereof he knew nothing, because their outsides were so like, that they could not be distinguished; for such twins have been seen." Henceforth, Locke's conception of personal identity found it not on the substance or the body, but in the "same continued consciousness", which is also distinct from the soul. 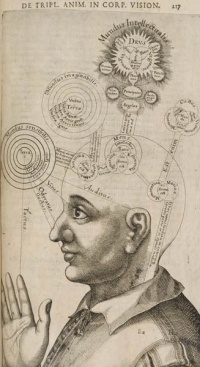 He creates a third term between the soul and the body—and Locke's thought may certainly be meditated by those who, following a scientist ideology, would identify too quickly the brain to consciousness. For the brain, as the body and as any substance, may change, while consciousness remains the same. Therefore personal identity is not in the brain, but in consciousness. However, Locke's theory also reveals his debt to theology and to Apocalyptic "great day", which by advance excuse any failings of human justice and therefore humanity's miserable state. Theater also concerns itself with other awareness besides self-awareness. There is a possible correlation between the experience of the theater audience and individual self-awareness. As actors and audiences must not "break" the fourth wall in order to maintain context, so individuals must not be aware of the artificial, or the constructed perception of his or her reality. This suggests that both self-awareness and the social constructs applied to others are artificial continuums just as theater is. Theatrical efforts such as Six Characters in Search of an Author, or The Wonderful Wizard of Oz, construct yet another layer of the fourth wall, but they do not destroy the primary illusion. Refer to Erving Goffman's Frame Analysis: An Essay on the Organization of Experience. Thus far, there is evidence that bottlenose dolphins, some apes, and elephants may have the capacity to be self-aware. Recent studies from the Goethe University Frankfurt show that magpies may also possess self-awareness. Common speculation suggests that some other animals may be self-aware. In science fiction, self-awareness describes an essential human property that bestows "personhood" onto a non-human. If a computer, alien or other object is described as "self-aware", the reader may assume that it will be treated as a completely human character, with similar rights, capabilities and desires to a normal human being. The words "sentience", "sapience" and "consciousness" are used in similar ways in science fiction. As a form of intelligence, self-awareness can be an understanding of one's own knowledge, attitudes, and opinions. Alfred Binet's first attempts to create an intelligence test included items for "auto-critique" – a critical understanding of oneself. Surprisingly we do not have a privileged access to our own opinions and knowledge directly. For instance, if we try to enumerate all the members of any conceptual category we know, our production falls much short of our recognition of members of that category. Albert Bandura has created a category called self-efficacy that builds on our varying degrees of self-awareness. Our general inaccuracy about our own abilities, knowledge, and opinions has created many popular phenomena for research such as the better than average effect. For instance, 90% of drivers may believe that they are "better than average" (Swenson, 1981) Their inaccuracy comes from the absence of a clear definable measure of driving ability and their own limited self-awareness; and this of course underlines the importance of objective standards to inform our subjective self-awareness in all domains. Inaccuracy in our opinion seems particularly disturbing, for what is more personal than opinions. Yet, inconsistency in our opinion is as strong as in our knowledge of facts. For instance, people who call themselves opposite extremes in political views often hold not just overlapping political views, but views that are central to the opposite extreme. Reconciling such differences proves difficult and gave rise to Leon Festinger's theory of Cognitive Dissonance. Unless indicated otherwise, the text in this article is either based on Wikipedia article "Self-awareness" or another language Wikipedia page thereof used under the terms of the GNU Free Documentation License; or on original research by Jahsonic and friends. See Art and Popular Culture's copyright notice. This page was last modified 22:18, 14 November 2016.